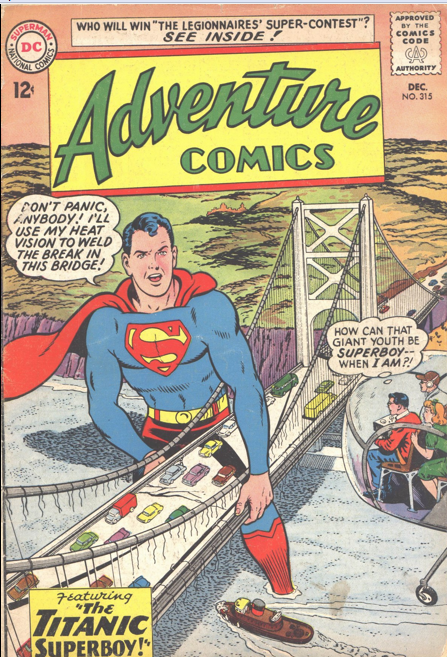 Superboy’s second run in Adventure Comics comes to a close in issue 458, with the xenophobe story by David Michelinie, Joe Staton and Jack Abel. 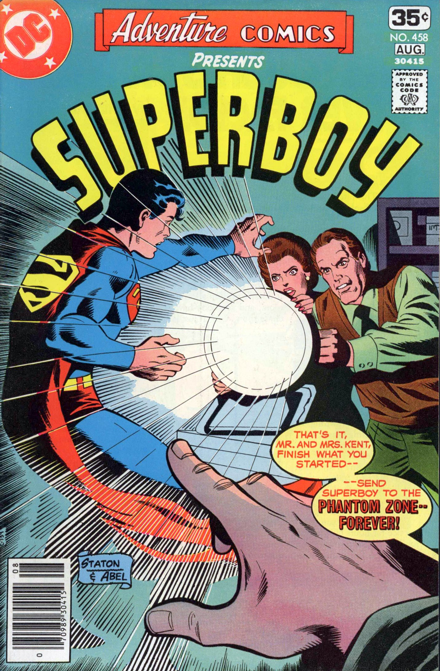 Thanks to his mental control of Ma and Pa Kent, Lester Wallac learns of the Phantom Zone projector, and uses it against Superboy, sending him to the Zone. 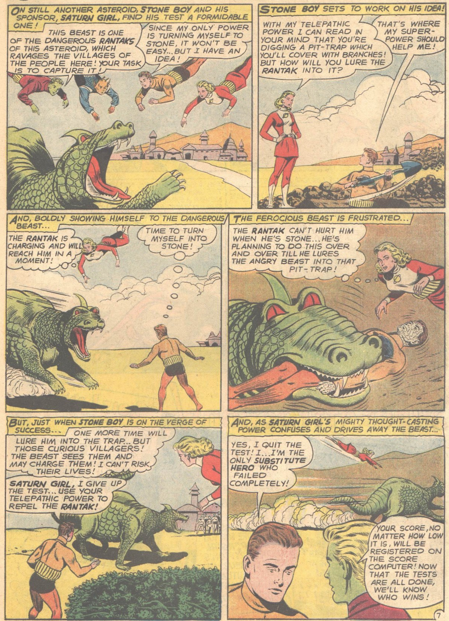 There Superboy encounters Zan-Em, who has been mentally influencing Wallace and controlling his actions! 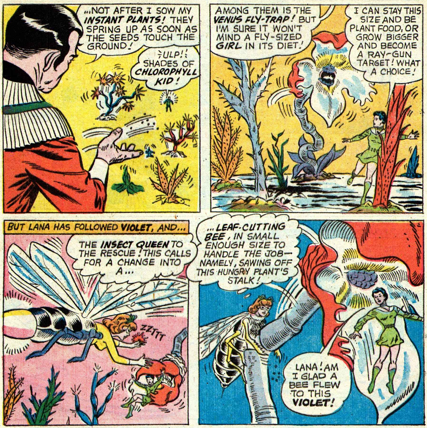 Seeing Wallace about to attack Lana Lang with a knife, Superboy defeats Zan-Em and re-emerges from the Zone. With Zan-Em defeated, Wallace regains control of his mind, realizes what he has done, and uses the Phantom Zone projector on himself. Superboy’s series moves briefly back into Superman Family. 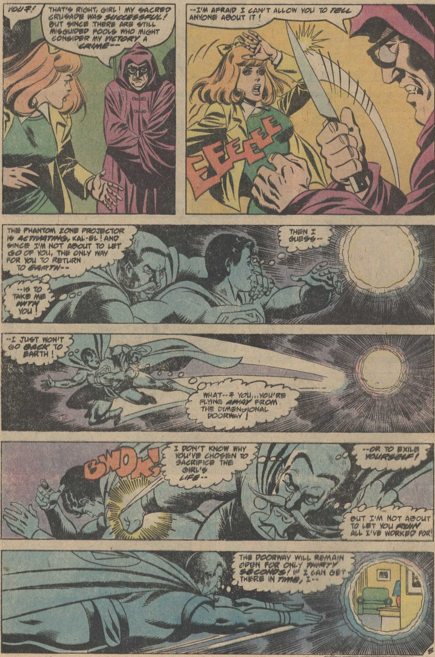 The conclusion of the Eclipso story by Len Wein and Joe Orlando reveals that, permanently split, Eclipso and Bruce Gordon will each fade from existence. Eclipso has rigged a Zeiss projector to draw stellar power that will enable him to survive while Bruce perishes. But of course Bruce tracks him down, and the combination of the black diamond, and Professor Bennet’s re-rigging of the Zeiss projector re-merge Eclipso and Bruce Gordon. An adequate Eclipso story, but nothing memorable. 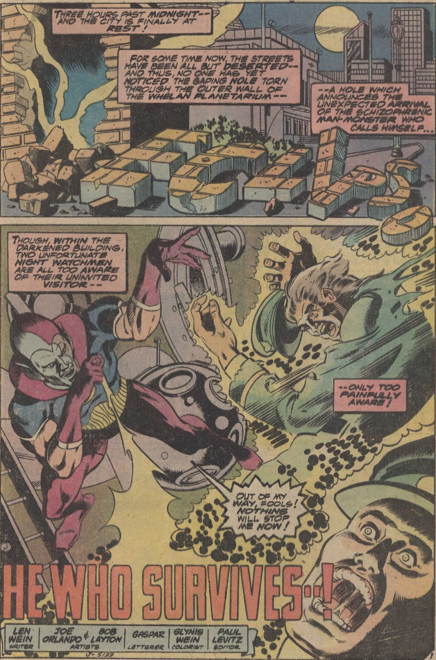 Both Eclipso and Bruce Gordon next appear in the pages of Green Lantern through the early 80s. Professor Bennet and Mona have to wait until Eclipso’s next solo outing for their returns, in the Eclipso: The Darkness Within mini-series and follow-up book in the mid-90s. 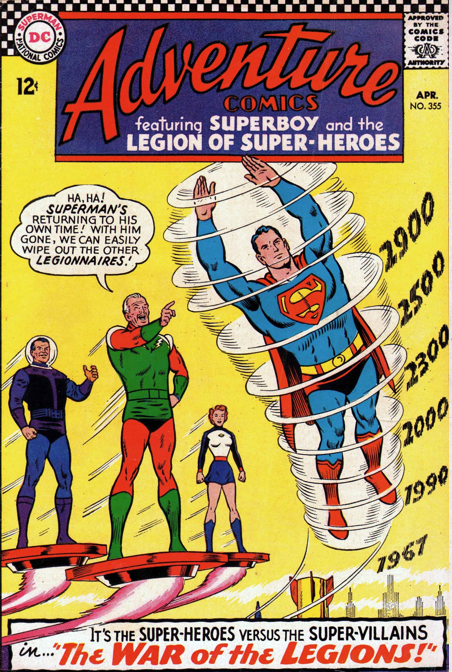 Superboy had been pushed out of his own comic by the Legion of Super-Heroes, much as had happened earlier in Adventure Comics. 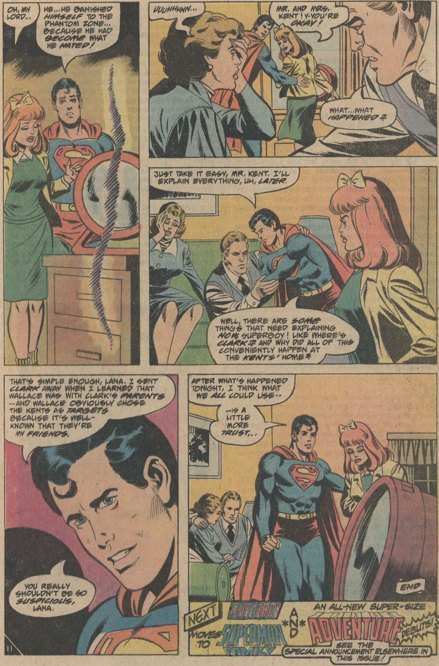 After a couple of solo stories in Superman Family, he returned to headline Adventure with issue 453 (Oct 77). 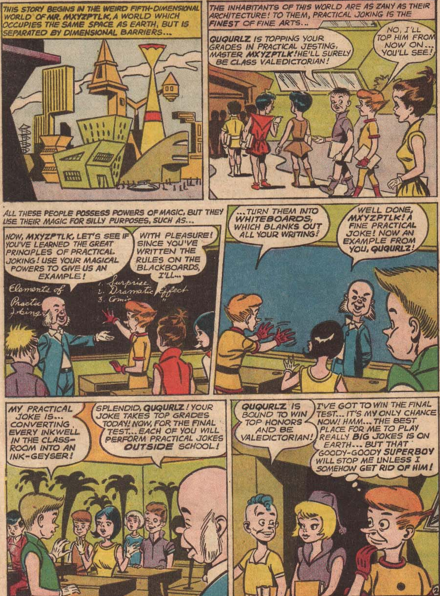 The story, by Bob Rozakis, with art by John Calnan and Murphy Anderson, has Clark at a summer camp, along with Pete Ross and Lana Lang. For some reason, he also brings the magical crystal from a recent adventure with the Legion, which has the effect of giving a young girl the super-powers she wishes for. 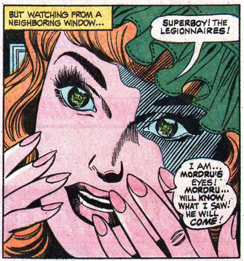 These first manifest that night, as Lana tells a ghost story to the campers, and Pete and Clark attempt to scare them. 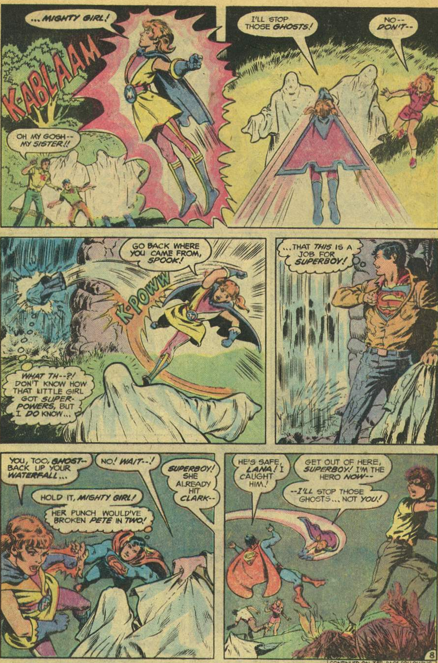 The girl transforms into Mighty Girl, and battles Superboy to a standstill, until he figures out the crystal was responsible and throws it into the sun. 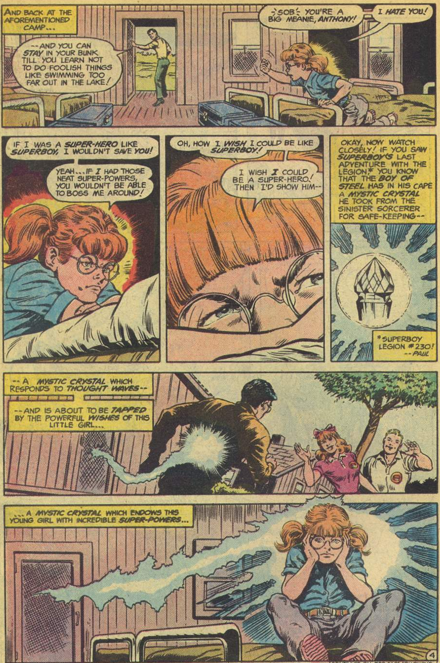 There is a nice twist in the final panel, as we discover that the girl is the young Barbara Gordon, later to become Batgirl, which makes her older brother Tony Gordon, currently appearing in her series in Batman Family. 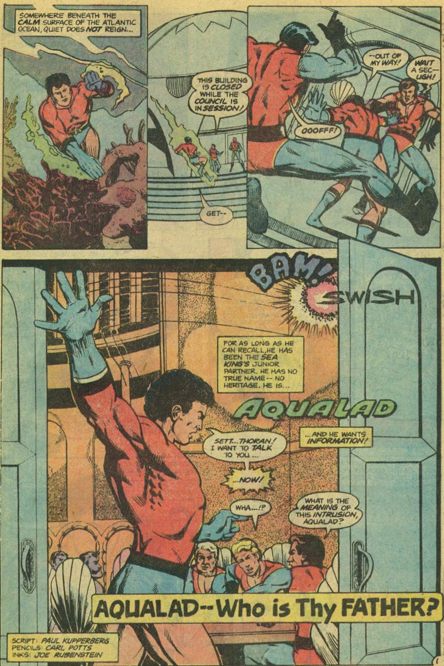 Aqualad begins a three-part solo feature, written by Paul Kupperberg, with art by Carl Potts and Joe Rubenstein. It follows directly on the previous issue, with Aqualad confronting the Idyllists, attempting to find out who his parents were. Their refusal to tell him simply motivates him to attempt to break into their records and find out for himself, but they fend him off. After having Aquaman try to kill him last issue, poor Garth is having a rough time of it. This is Aqualad’s first ongoing series, although he did have a couple of solo adventures in the pages of Teen Titans. 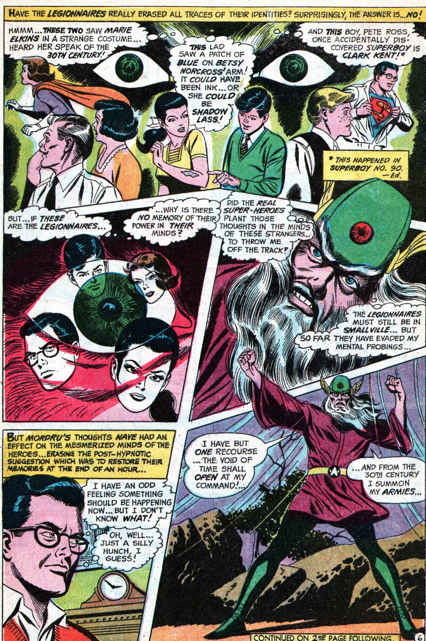 Adventure 370 (July 1968) concludes the introduction of Mordru storyline by Jim Shooter and Curt Swan. 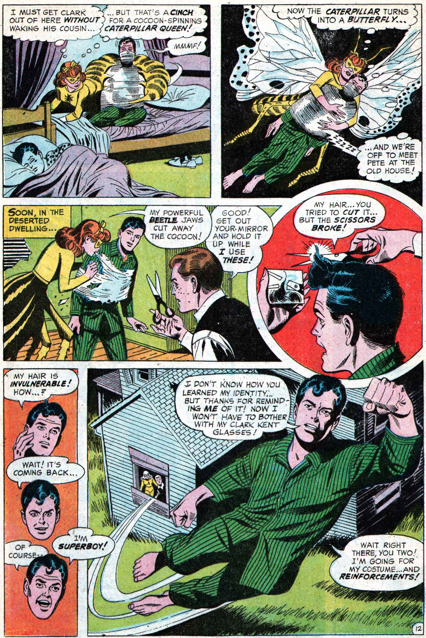 Superboy uses his hypnosis machine to erase the Legionnaires memories of their real identities for an hour, correctly assuming that Mordru will search everyone’s minds in his hunt for them. 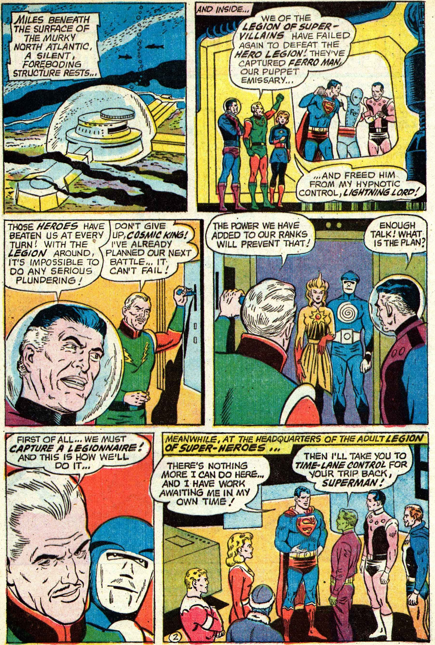 What he doesn’t realize is that Mordru’s magical hunt will alter the effects of the machine, extending the memory loss. 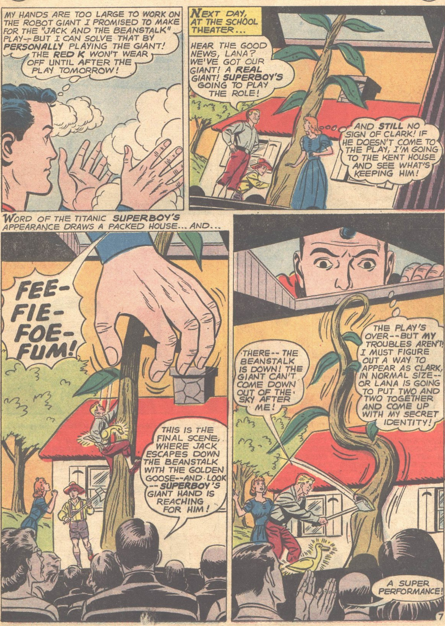 As Mordru takes control of Smallville, Pete Ross realizes Clark must have lot his memory of being Superboy, and goes to Lana for help. 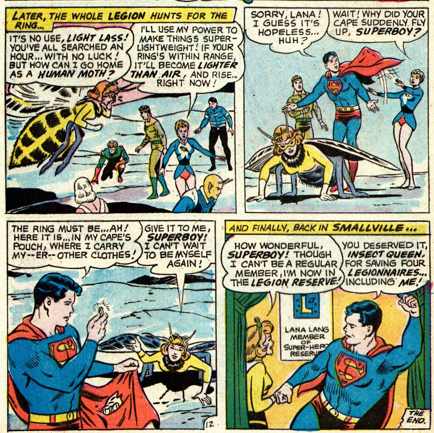 She dons her Insect Queen guise, and together they restore Superboy’s memory. 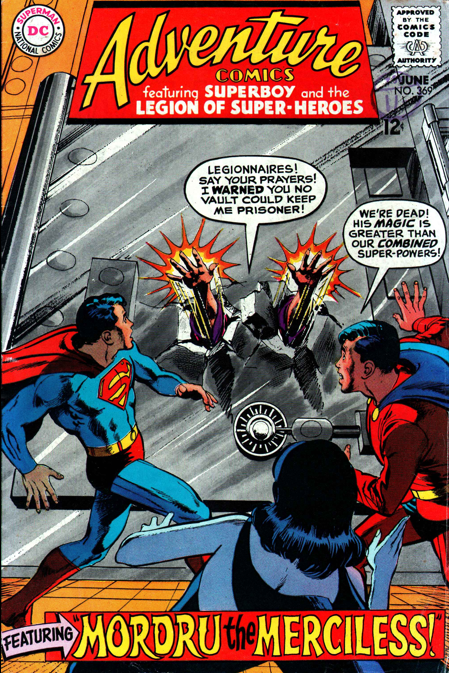 But once the Legionnaires are back in action, they fall to the extremely powerful villain, who puts them on trial, along with Lana and Pete, and imprisons them all in a lead and kryptonite cage. Or so it seems. Mon-El and Superboy are both puzzled by its lack of effect, and it turns out one of Mordru’s pawns is working against him. Deception follows deception. 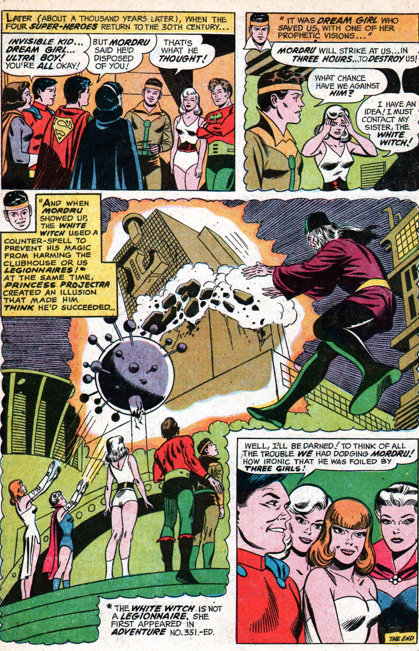 Mordru believes he has destroyed Legion headquarters, but that was an illusion cast by Princess Projectra and White Witch, alterted by a vision by Dream Girl. 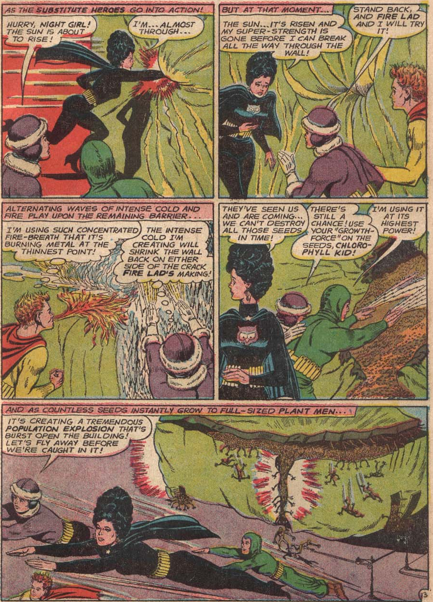 Mordru’s attempt to destroy Superboy, Mon-El, Duo Damsel, Shadow Lass, Pete Ross and Insect Queen backfires completely as the fireball he creates causes a cave-in, entombing him. 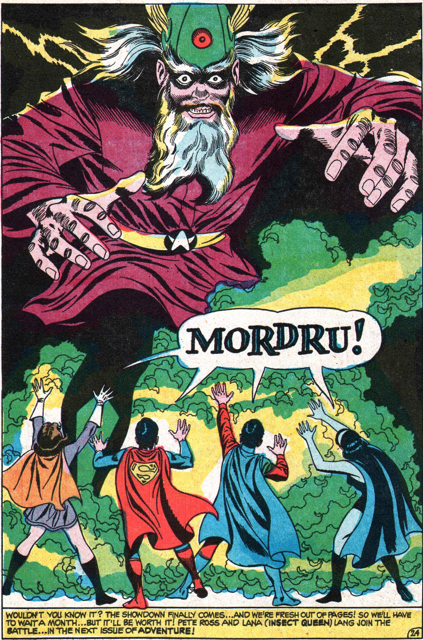 And being buried is the only thing that renders Mordru helpless. A great tale all around, and one of the first Legion stories I read, in the oversize reprint from the 70s. 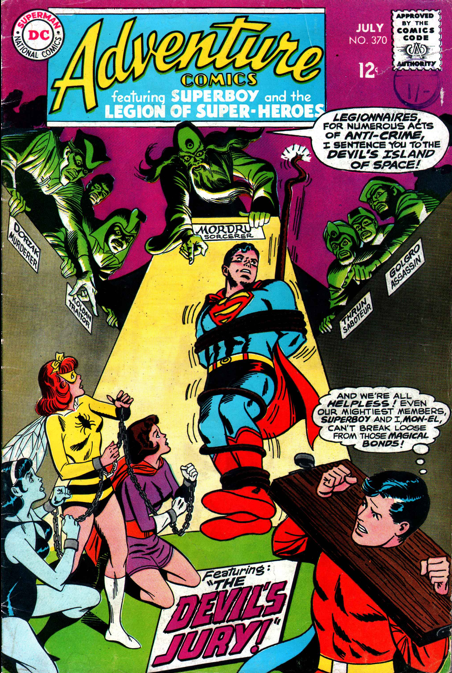 The last great Legion story from its run in Adventure Comics is this 2-parter beginning in issue 369 (June 1968), as Jim Shooter and Curt Swan introduce the sorceror Mordru. Shadow Lass goes poking around Legion headquarters, and when she finds a massive sealed chamber, she does the rational thing and starts to open it. Mon-El tries to stop her, but too late. 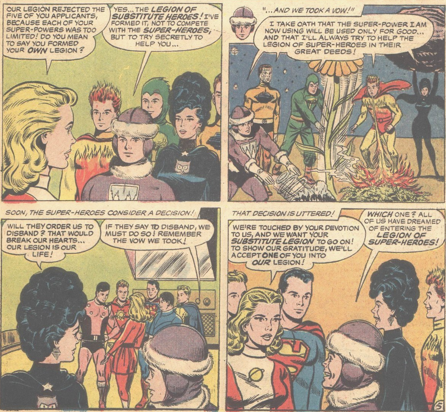 As Mordru frees himself the four Legionnaires who happen to be there (Superboy and Duo Damsel being the other two) flee in the Time Cube back to Superboy’s Smallville to hide. 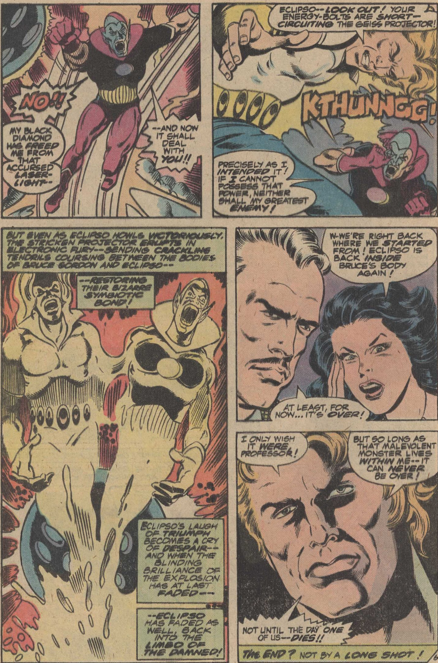 Although this was Mordru’s debut, the tale gives him a backstory and previous encounter with the Legion, explaining how he wound up in the vault. However, when this battle occurred is a bit of a mystery. It would seem to have to have taken place after the new headquarters were built, or the vault would likely have been cracked open during the Fatal Five’s assault on the Clubhouse. But it’s also clear that it took place before Shadow Lass became a member, which of course she became DURING the Fatal Five’s assault on the Clubhouse. So it’s a puzzlement. At any rate, the four try to blend in to life in Smallville. 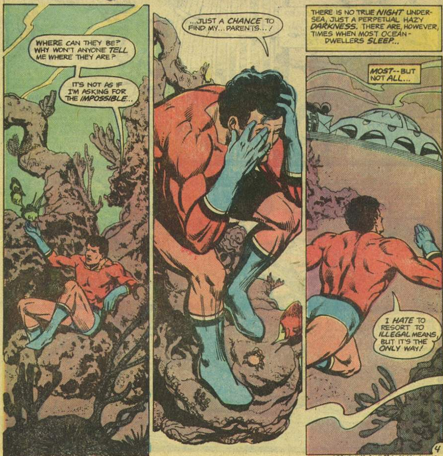 Mon-El re-adopts the identity of Bob Cobb, which he used there previously, when he first met Superboy. Shadow Lass gets some good body make-up to let her blend in, and moves in with Lana Lang as an exchange student. Duo Damsel pretends to be a distant relative of Police Chief Parker. 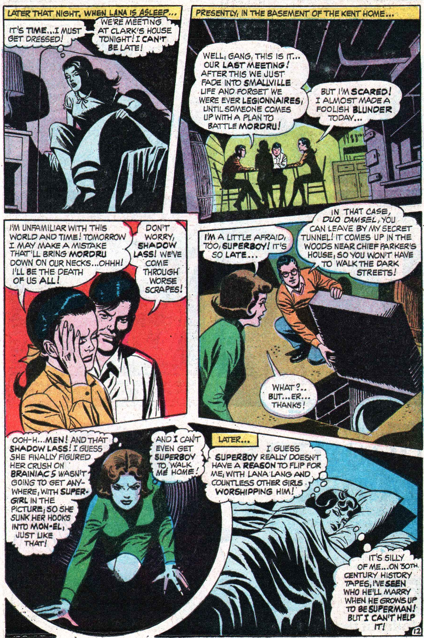 She also gets a much beloved scene, as Shadow Lass switches her affections from Brainiac 5 to Mon-El, but Duo Damsel’s attempts at some romantic interaction with Superboy result in her having to clamber through a sewer on her own. 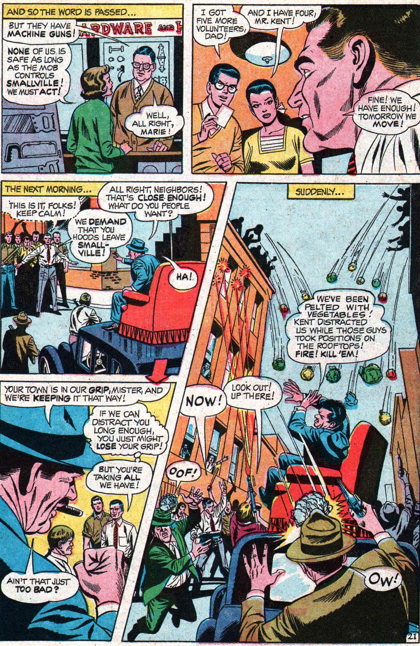 Mobster “King Carter then tries to take over Smallville, and the heroes are reluctant to use their powers and give themselves away, figuring (rightly) that Mordru has spies looking for them. But rather than just cower in fear, they lead the townspeople in standing up to the hood and driving him out of town. 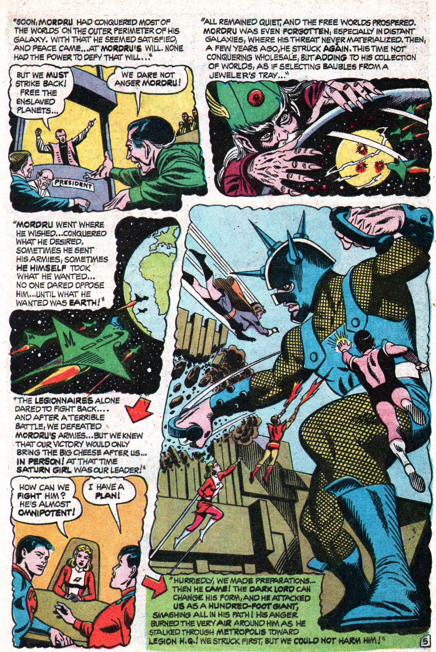 Feeling guilty about hiding instead of fighting, they don their costumes one night, prepared to take on Mordru, but Lana Lang is one of his unwitting spies and sees them. 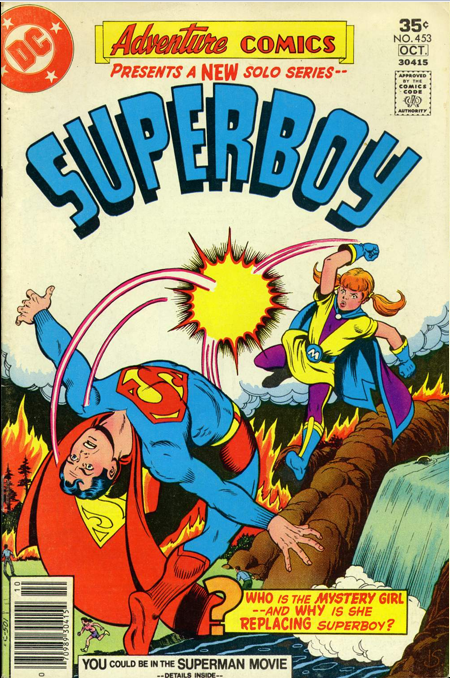 After nearly 20 years, Superboy’s series in Adventure comes to an end with issue 315 (Dec 63). 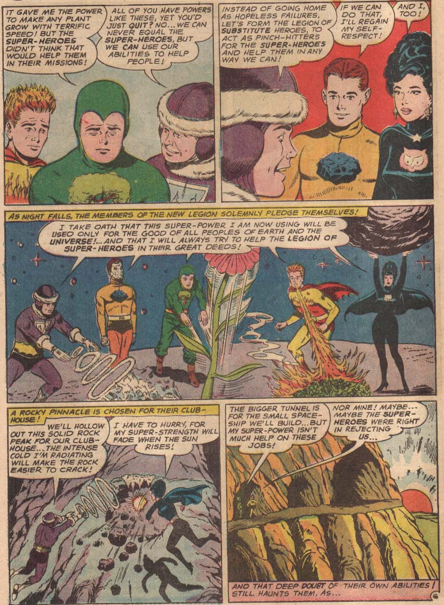 Reprints of earlier stories would run as a backup feature in most issues of Adventure through 1964, and of course he would appear in many of the Legion of Super-Heroes stories. His own book was still running as well. 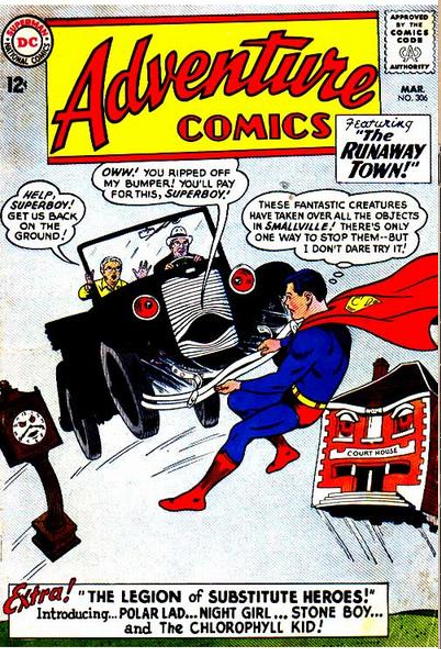 Superboy would return as the cover feature in Adventure Comics in the late 70s. 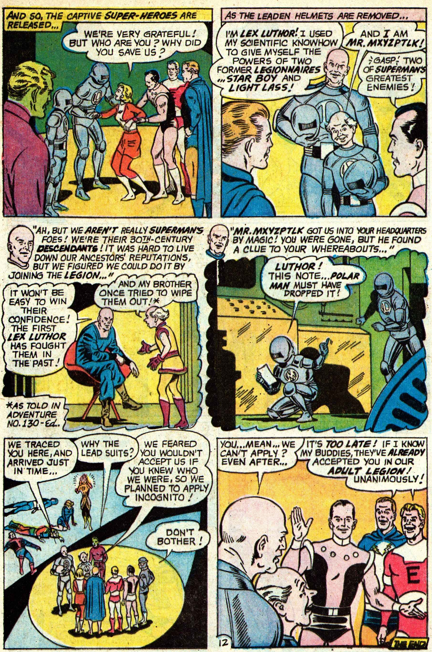 The Legion is very excited about their new Universe Monitor, but it quickly proves itself not up to the task as alien invaders manipulate its feed, while they invade Earth. The Substitute Legion, not having any such equipment in their cave, see the invasion and fight off the alien raiders, and the Legion finally come to learn of their existence. 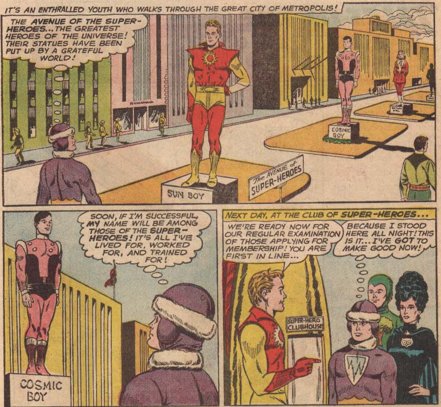 Impressed, Saturn Girl decides to hold a contest, and reward the highest scoring Sub with membership in the Legion. Each are given tasks that their powers seem useless for, but each also figures out a way to succeed, except for Stone Boy. 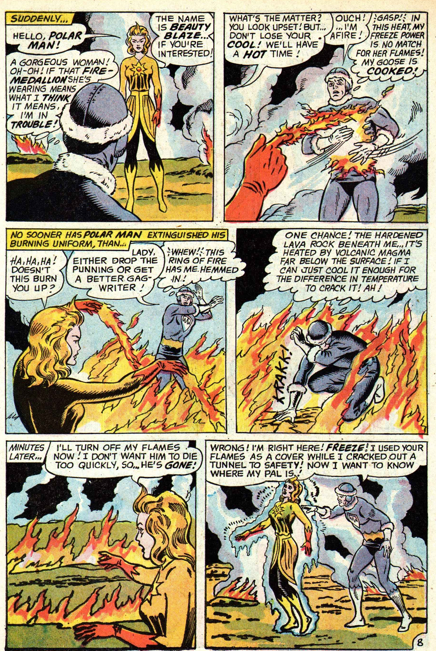 He gives up on his task, asking Saturn Girl to complete it, in order to protect some villagers who have come too close to the beast he was supposed to apprehend. His selflessness scores the highest points, and Stone Boy is awarded Legion membership, but declines so that he can stay with his friends. A nice little tale by Edmond Hamilton, that scares us with the possibility that a person whose power is standing motionless might have become a Legionnaire. 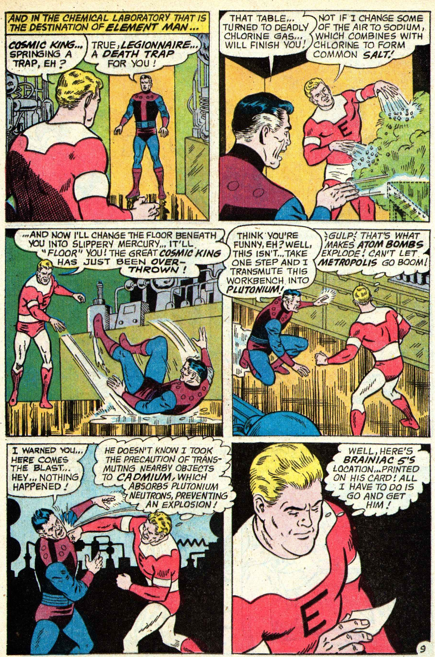 Red kryptonite is the menace in Superboy’s final outing in Adventure. He uses a piece he was previously exposed to in order to stop a cyclotron exploding, but that causes it to be able to affect him again. Though where the reed k originally shrunk him, this time it makes him gigantic. 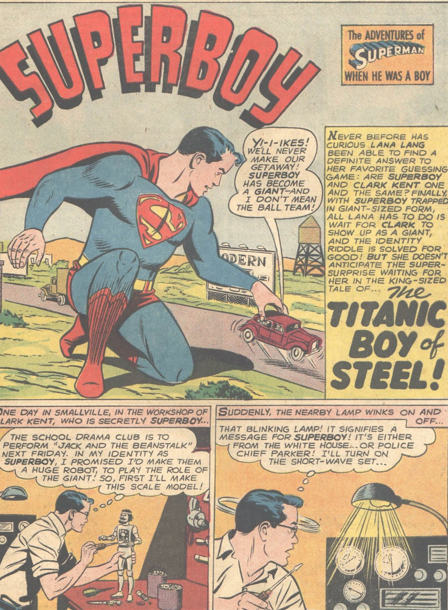 Primarily, this is a goofy little story, played for laughs with the giant Superboy. 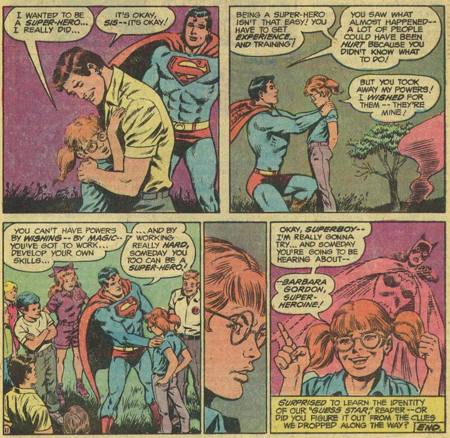 Lana Lang tries to use the situation to prove the missing Clark Kent is really the giant Superboy, but Colossal Boy helps him cover his identity. 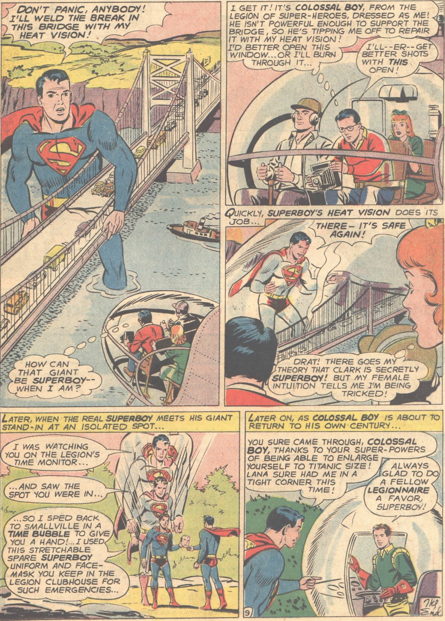 After the red k wears off, Clark appears before Lana while a disguised Colossal Boy holds up a collapsing bridge. 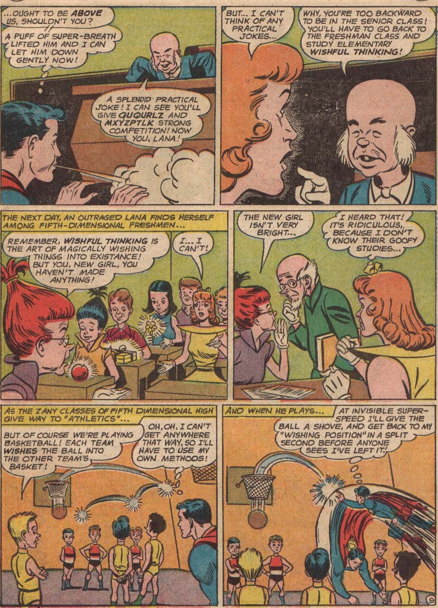 The young Mr. Mxyzptlk had been introduced into the Superboy’s world in his own book, and makes his first appearance in the Superboy series in Adventure in issue 306 (March 1963). Bored of school in the 5th Dimension, he heads to Smallville where he tricks Lana Lang, and then Superboy, into heading to his dimension while he runs wild in their hometown. It’s a fun little tale, which gives the reader more of a view of the 5th Dimension world than is generally seen. At a time when most comics had a supporting cast that could be counted on one hand, the Legion of Super-Heroes just kept adding more and more characters into the mix. 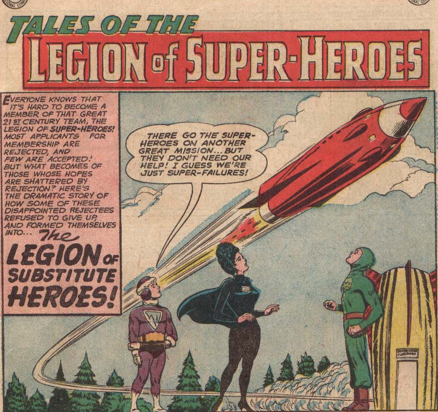 This story introduced not only five new heroes, but even banded them into a supporting team, with the unenviable name of the Legion of Substitute Heroes. Polar Boy, Night Girl, Stone Boy, Fire Lad and Chlorophyll Kid are all rejected for Legion membership. They do get nifty flight belts as parting gifts, though. Undeterred, they form their own team, and hang out in a cave just outside the city. We learn a little of the origin of each hero. Polar Boy is from a very hot world where everyone has the power to radiate cold, and Stone Boy is from a world where people “hibernate” by turning to stone. Night Girl lives on a world shrouded in darkness, so was unaware that her powers faded in sunlight until she came to apply for Legion membership. Fire Lad acquired flame breath after exposure to a meteor. 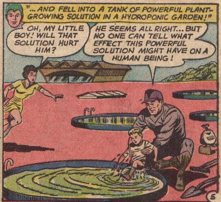 But the best of these is the origin of Chlorophyll Kid, whose ability to stimulate plant growth came after falling into an experimental solution as a child. The Legion really take a back seat to the Subs in this story. After a few attempts to help the Legion, the Subs discover that some unmanned rockets the team is fighting are really transporting alien plant life as part of an invasion. They head to the world the ships are coming from, and destroy the floral army. 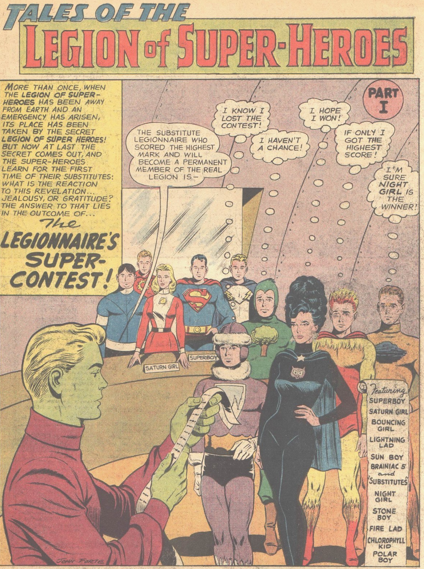 The people of Earth, and the Legion of Super-Heroes, are unaware of the achievement of the Subs, but this team of rejects has proved themselves to the readers, and they would remain frequent supporting characters through the Legion’s run in Adventure. This is also the first of Edmond Hamilton’s stories in this run. 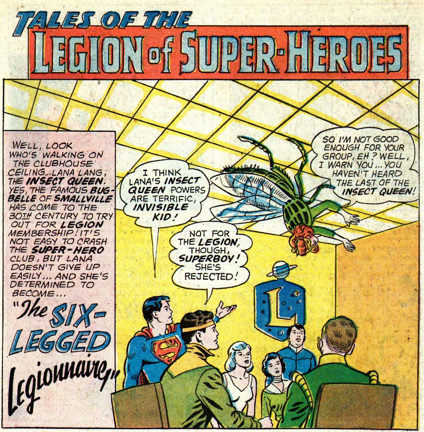 While Jerry Siegel’s Legion tales tended to be very much a part of the Superman universe, Hamilton was more interested in expanding the Legion’s own reality, and is my favourite of the Legion’s scripters during this early period.